I lived in Australia from October, 2008, until April, 2010. For about one year of this time, I lived in a van. This allowed me to drive around the entire country, and see a huge portion of it. The landscapes are as varied as the wildlife. I went on a cruise with Tasman Island Cruises near Port Arthur, in southeast Tasmania, in the fall of 2010. 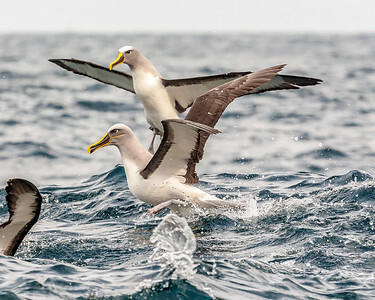 Although we saw a number of seals, and more types of birds than I can count, the albatross were my favorite to watch, as they tended to be the most active, as seen in this photo, in which several albatross are seen hunting for fish. Available in the following sizes (Rectangle A): 10x8, 14x11. It took me several attempts to get this photo composed as it is seen here. The ghostly looking water in is the result of a wave coming in, and then receding out of frame. It took several tries to get it to occupy the portion of the frame that it does, with the nice diagonal divide. 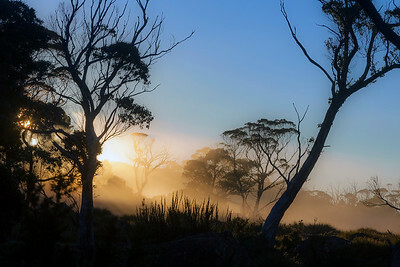 I took this shot in the southeast corner of Tasmania. Available in the following sizes (Rectangle B): 12x8, 18x12, 24x16, 30x20, 36x24, 45x30. 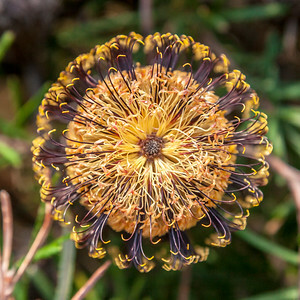 This strange-looking flower is a silver banksia. 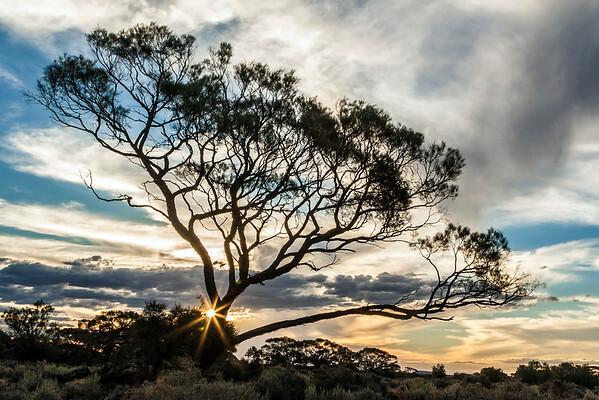 It grows throughout southeastern Australia, and in some cases, the tree on which they grow can reach up to 40 feet in height. Available in the following sizes (Square): 10x10, 12x12, 16x16, 20x20. 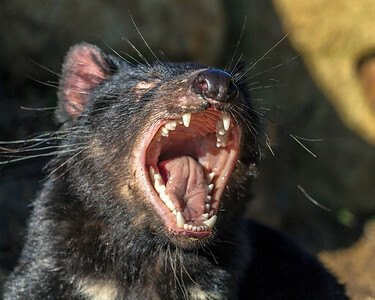 A yawning Tasmanian Devil. These guys are quite difficult to spot in the wild. Many of the Tasmanians I spoke with while on the island had never seen one outside of captivity. I took this picture at the Tasmanian Devil Conservation Park, in Taranna, Tasmania. Available in the following sizes (Rectangle A): 10x8, 14x11, 20x16, 24x20, 30x24. Eastern Tasmania's Freycinet National Park has some of the most gorgeous coastal scenery I've ever had the joy of viewing. When I am traveling, it is quite infrequent that I visit a specific place on more than one occasion, but I'd visited this location the evening before, and recognized that with proper lighting, it could be a truly beautiful sunrise location. So I broke with my traditional practice, and returned on the 14th in order to get this shot. Available in the following sizes (Rectangle B): 8x12, 12x18, 16x24, 20x30, 24x36. 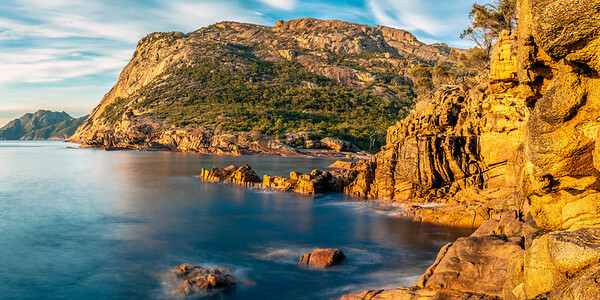 Frecinet National Park, located on a small peninsula on the east coast of Tasmania, Australia, is one of the most photogenic locations I've ever visited. The yellow and orange rocks that dominate the National Park plunge into blue waters, and at sunrise, the contrast is simply stunning. Available in the following sizes (Panorama A): 20x10, 24x12, 32x16, 40x20, 48x24, 48x24 Triptych (3 x 16x24), 60x30, 60x30 Triptych (3 x 20x30), 72x36, 72x36 Triptych (3 x 24x36). 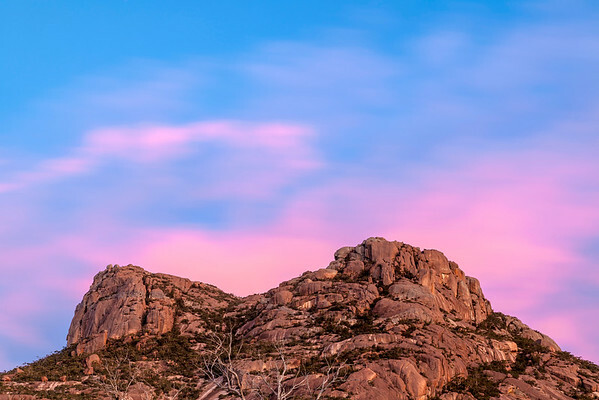 It isn't every evening that one sees the clouds turn as ridiculously pink as they did on the evening of April 13, 2010, when I took this photo in Tasmania's spectacular Freycinet National Park. Although the National Park is most famous for its coastal scenery, it also has its share of mountains and forests that are arguably as beautiful. Available in the following sizes (Rectangle A): 8x10, 11x14, 16x20, 20x24. 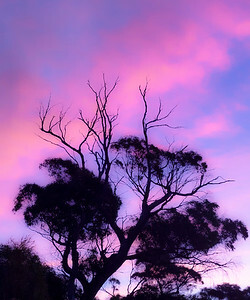 I took this photo on the evening of April 13, 2010, on my way back to the car from a 7-mile hike to Freycinet National Park's beautiful and famous Wineglass Beach. Seeing the clouds light up in this otherworldly pink hue was a perfect way to end an incredible hike and an incredible day in one of the world's most beautiful coastal locations. Available in the following sizes (Rectangle B): 12x8, 18x12, 24x16, 30x20, 36x24, 45x30. 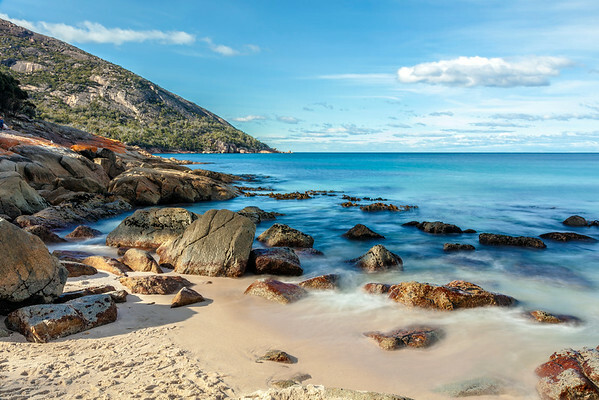 It is a bit of a walk to get to Freycinet National Park's beautiful Wineglass Bay. One cannot simply park at an adjacent parking lot and walk on over. It is a 7-mile loop to get there and back, and the entire hike is gorgeous. Available in the following sizes (Rectangle B): 12x8, 18x12, 24x16, 30x20, 36x24, 45x30. 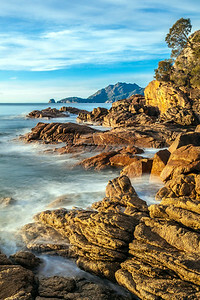 Freycinet National Park, located on a small peninsula on the east coast of Tasmania, Australia, is extremely photogenic. Orange rocks, forests, mountains, and the blue and turquoise waters of Great Oyster Bay make for a tremendous panorama of Honeymoon Bay. Available in the following sizes (Panorama C): 30x10, 36x12, 48x16, 48x16 Triptych (3 x 16x16), 60x20, 60x20 Triptych (3 x 20x20), 72x24, 72x24 Triptych (3 x 24x24), 90x30, 90x30 Triptych (3 x 30x30). I took this photo on the third of seven days I spent on the Overland Track, which travels roughly 40 miles through some of Tasmania's most beautiful natural scenery. It was difficult to drag myself out of my sleeping bag before sunrise each of these days, especially after spending the entirity of each of the prior days walking through mountainous terrain, but photos like this made it all worth it. Available in the following sizes (Rectangle B): 12x8, 18x12, 24x16, 30x20. 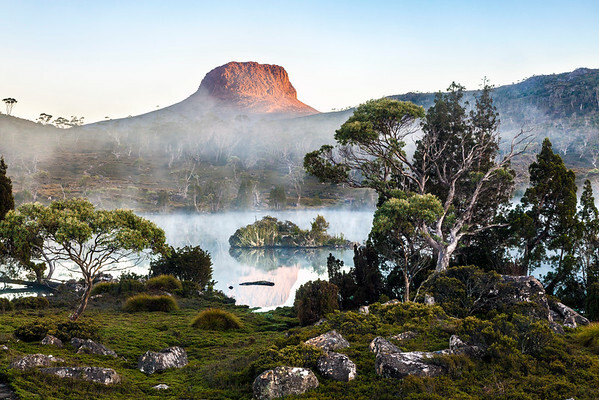 The Overland Track, a 65 kilometer (40 mile) trail in Cradle Mountain-Lake St. Clair National Park, is an incredible trek that allows hikers to experience the incredible diversity of Tasmania's ecosystem. This is a sunrise shot of Barn Bluff reflected in Lake Windermere, taken on my third day on the trail. Available in the following sizes (Rectangle B): 12x8, 18x12, 24x16, 30x20, 36x24, 45x30. I arrived in Tasmania without much of a plan for how to spend my first few days. 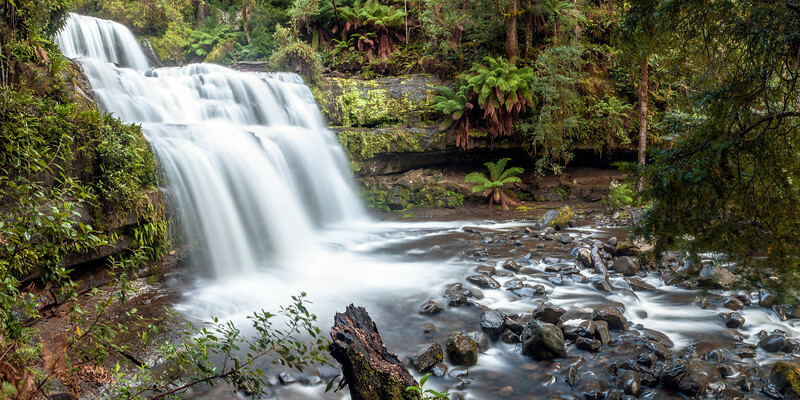 My first stop after getting off the extremely expensive ferry that travels between the relatively small island of Tasmania and the mainland was Liffey Falls, shown here. I'd lived in New Zealand for roughly seven months before moving to Australia, about a year and a half before I took this photo, and my first thought when seeing Liffey Falls was, “Wow! This reminds me a lot of New Zealand!” Available in the following sizes (Panorama A): 20x10, 24x12, 32x16, 40x20, 48x24, 48x24 Triptych (3 x 16x24). I stopped at Cape Nelson hoping to see blue whales, which are occasionally visible from this location on Australia's southeast coast. 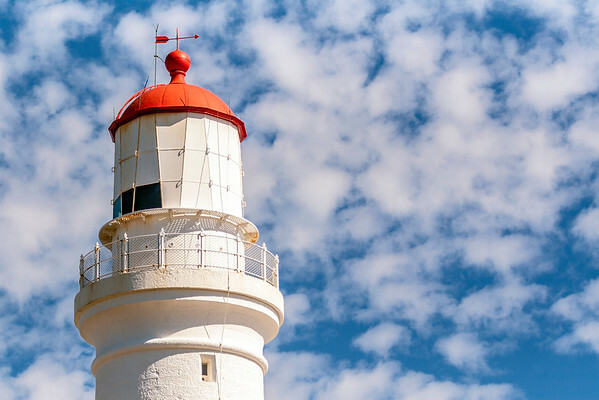 I wasn't lucky enough to spot any of the world's largest animals, but I did get this simple, beautiful shot of Cape Nelson Lighthouse. Available in the following sizes (Rectangle B): 12x8, 18x12, 24x16. 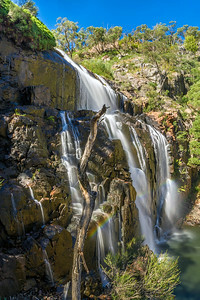 MacKenzie Falls, in Grampians National Park, Victoria. A beautiful National Park easily accessible to Melbourne, it's only a 3-hour drive, and well worth it. Available in the following sizes (Rectangle B): 8x12, 12x18, 16x24, 20x30, 24x36. I camped here one night, a few miles from Port Augusta, South Australia. Most of the surrounding vegetation was limited to grasses and bushes, but this tree made a perfect foreground for this sunset shot. Available in the following sizes (Rectangle B): 12x8, 18x12, 24x16. When I took this photo, I didn't immediately realize how lucky I was to be doing so. All the roads through Uluru-Kata Tjuta National Park, in Australia's Northern Territory, are two-lane, and pullouts are uncommon. So, when I saw this guy crossing the road, I avoided him, and pulled over onto the shoulder in order to wait for him to get onto more natural-looking territory, then snapped off a few dozen photos. While I was stopped, a Park Ranger pulled up behind me and told me that I wasn't allowed to stop on the side of the road. He allowed me to take a few more photos, though, before I got on my way. 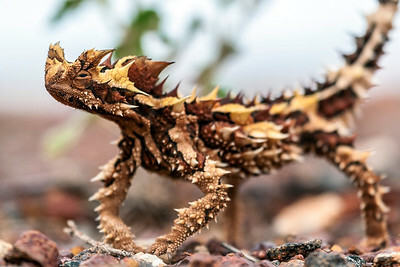 He informed me before I left that, although he'd been a Ranger at Uluru-Kata Tjuta National Park for a number of years, he'd never seen a “thorny devil” - the peculiar lizard shown here – until that very day. Available in the following sizes (Rectangle B): 12x8, 18x12. The number of flies that dominated Uluru-Kata Tjuta National Park when I visited in March, 2010, made walking around almost unbearable. An experience that cannot be described, and I hope to never go through again. Ugh. 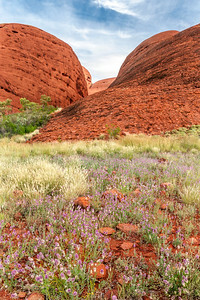 But I did force myself to walk around inside the Kata Tjuta, and considered myself to be extremely lucky to be there during a relatively uncommon blooming of flowers, precipitated by weeks of heavier-than-usual rain prior to my arrival. Available in the following sizes (Rectangle B): 8x12, 12x18, 16x24, 20x30. This is probably my favorite photo I took during the year and a half I lived in Australia. Many people have heard of Uluru (or Ayer's Rock, as it is sometimes called), but far fewer have heard of its sister formation, the Kata Tjuta, shown here. Personally, I think Kata Tjuta is even more beautiful than Uluru. I had to get up pretty early in order to be here for sunrise, but the sleep I lost was completely worth it. The amount of green on the trees in this photo is quite unusual – it had rained quite heavily in the weeks leading up to my arrival, which resulted in significantly more plant life than is typical of the region. 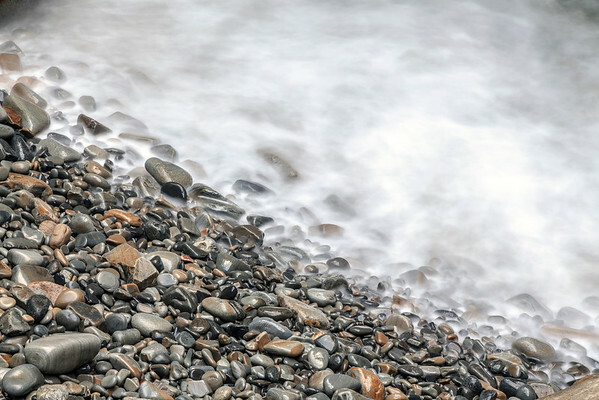 Available in the following sizes (Panorama C): 30x10, 36x12, 48x16, 48x16 Triptych (3 x 16x16).